A chef known for his emphasis on creating delicious dishes with fresh, premium ingredients, Chef Michael Chiarello uses panko as his go-to bread crumb for a crunch that won’t quit. As an Emmy-award winning TV chef and cookbook author, Chef Chiarello is the tastemaker behind Bottega Napa Valley Restaurant, NapaStyle and Chiarello Family Vineyards, and appears on The Cooking Channel and Top Chef Masters only on Bravo. Last February I was lucky enough to join Bush's Beans and three other fabulous bloggers for dinner at the beautiful Bottega Restaruant in Napa Valley. Breath taking is what comes to mind when I describe Michael Chiarellos Restaurant. The food at Bottega was delicious to say the least. There were so many wonderful dishes that is was so hard to choose just one. 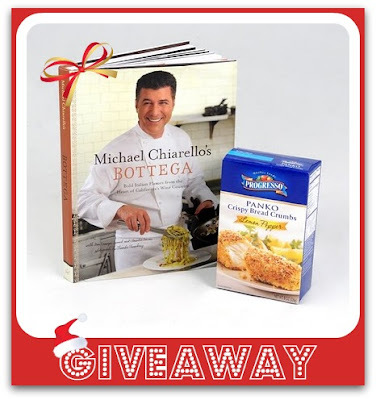 I was so excited when Myblogspark asked me to try Progresso's New Lemon Pepper Panko Bread Crumbs as well as receive a copy of Michael Chiarello's Bottega Cookbook. Italian Food is up high on my list of favorite foods, so I am really excited to cook up some of Michael Chiarellos wonderful Botegga recipes in my own kitchen. The next time I prepare my favorite Homemade Fish Sticks, pictured above I'm going to use the Lemon Pepper Panko Bread Crumbs instead. I usually use the plain panko bread crumbs, so this will be interesting to see how the lemon pepper ones compare. But don't stop there Progresso's Panko Bread Crumbs can be used on dishes other than fish. Chef Chiarello is helping cooks everywhere use Progresso’s Panko to make flavorful, flawless recipes including Crispy Seafood Salad, Mama Chiarello's Stuffed Eggplant and Turkey Scallopini and Squash Ravioli with Cranberry Brown Butter. Whether frying, baking or broiling, this culinary superstar adds a flavorful crunch to create simple, savory recipes. Made from the soft, tender centers of the bread, Progresso Lemon Pepper Panko combines the perfect crunch with effortless flavor to give any dish that extra punch. The large, flaky crumb has a coarser texture than traditional bread crumbs, delivering a lighter, crunchier coating or topping. If you use regular style bread crumbs instead of panko it is time for a change. Once you try panko style bread crumbs you wont go back to ordinary bread crumbs again. Don't take my word for it. Would you ike to try Progesso's Lemon Pepper Panko Bread Crumbs? Today Mommy's Kitchen & MyblogSpark are giving away a Progresso Prize Pack to one of my lucky readers. To Enter this Giveaway:Mandatory Entry: Leave a comment telling me what type of dish would you create with Progresso Lemon Pepper Panko? For me I want to try it out on a lemon pepper shrimp scampi recipe. I think it would be a nice change. 1. Follow @mommyskitchen on Twitter and tweet this giveaway. Enter to win a Progresso Panko & Michael Chiarello Autographed Cookbook @mommyskitchen http://tinyurl.com/32mx2qs #myblogspark. Leave a comment with a link to your tweet. 2. Like - Mommy's Kitchen on Facebook and leave an additional comment. Contest Ends at Midnight CST on December 2, 2010. If the prize is not claimed in 48 hours a new winner will be chosen. Contest open to U.S. residents only. The winner will be announced on Mommy's Kitchen (and emailed). If you do not have a blog , please leave a email address in your comment so I can contact you if you are the winner. I am also including a link to the Progresso website for additional recipes, tips for cooking with panko, a video and a coupon for $1 off any panko flavor. 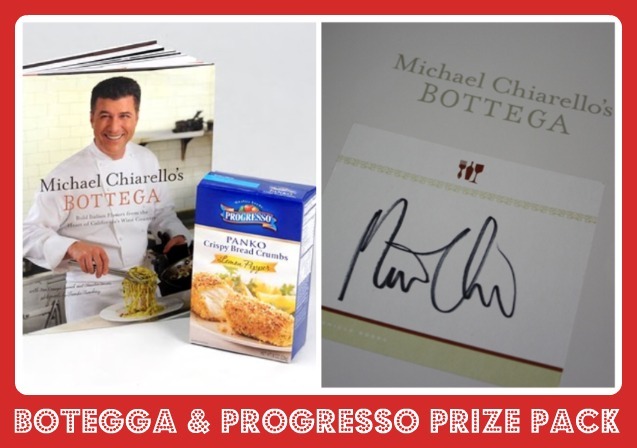 Additionally, be sure to check out the Progresso's Wine & Dine with Chef Michael Chiarello Sweepstakes. Before I go I wanted to let you know that now through December 31st, participants can enter for the chance to win a trip for two to Napa Valley to attend the Spring Bud Break Party, an annual dinner and wine tasting event taking place on May 7, 2011. In addition to two tickets to the party, the grand prize also includes roundtrip airfare and hotel accommodations. Visit http://www.progressobroth.com/ for the sweepstakes rules and entry form. Disclosure: General Mills & MyBlogSpark provided me with one copy of Michael Chiarellol's Cookbook as well as a package of Progresso's Lemon Pepper Panko for this review. They also supplied an additionsl gift pack to use in this giveawy. I want to thank General Mills & MyBlogSpark for sponsering this giveaway. I'd like to try this on some sort of fish. I think I'd add some Parm and use it to coat some thin chicken cutlets. I would love to try the lemon pepper panko to batter my chicken strips in for chicken planks...Also, using it with mozzarella cheese sticks would make great fried cheese sticks! I think I would use it on some cubed chicken to make homemade nuggets. I would use these on chicken tenders to give it a little bit of a different flavor! Would be excellent I think! I would try chicken piccata. Sounds like it could be a good twist. I would like to incorporate it into a chicken parm!! thanks for the giveaway! I would coat pounded out chicken breast and make a yummy dinner. Sounds good right now. I would love to try some on eggplant parm. I would like to try it on a super easy chicken recipe I have. You coat them with melted butter and then a combo of bread crumbs and parmesan cheese and bake. Yum. Great giveaway! I would definitely go with chicken tenders because of the kiddos. I would probably add it to some chicken and bake it. I would use them for chicken scallopini. I would bread some nice big fat shrimp with the lemon pepper Panko and then pan fry. I like you on Facebook. Thanks for another chance to win. I'd definitely use it on fish! Sounds super YUMMY! I'd love to use Lemon Pepper Panko Crumbs on a fish dish. Tilapia, salmon, or even catfish. I think I would like it on scallops or shrimp but of course chicken would be good too. I think I would try it on a deep fried pork chop. Lemon pepper and pork, do I need to say anymore? I have been loving tilapia lately, so I think I would try to crisp it up with the lemon pepper panko. YUM! I am such a huge fan of Eggplant Parmesan that I would give it try on them! I would so love a breaded shrimp on a bed of wild rice. I live in Florida, so of course, some kind of seafood sounds great. Shrimp, scallops or fish! I can't wait to try it! I would pound out a piece of pork tenderloin fairly thin, and then coat it with flour, dip in egg wash, and finally, the lemon pepper panko crumbs. Saute in butter until both sides are browned! I think I wouls like to try chicken of fish. I think I would make Crusted Lemon Pepper Chicken. lemon pepper panko + parmesan + tilapia = sounds delicious! It sounds like it would be good with some tilapia fillets. Yum! It would probably be some sort of chicken dish. I've read a lot about panko crumbs..I'd really like to try them! Like Mommy's Kichen on FB. I love panko bread crumbs, and the lemon pepper flavor sounds fantastic! I would try it on either some salmon or boneless chicken breasts. I would like lemon pepper panko with parmesan cheese, salt/pepper and tilapia. YUM! Lemon Pepper Panko screams "Chicken," but I'd coat planks of zucchini and yellow squash with Lemon Pepper Panko and fry, in EVOO, to a deep golden brown. Gosh, I haven't thought about Michael Chiarello in years! I adored his show "Easy Entertaining" when it was on Food Network. Michael is the ONLY chef I know who sucessfully combined rustic and elegant and made it chic. Oh my....I would use it on onion rings!!! I just ate at a place that used panko on their rings and they were dynomite!!! I'd also throw some on some chicken!! With chicken and attempt something like the chicken constelleta from chessecake factory. Those homemade fish sticks look good. I would probably try those. I like Mommy's Kitchen on Facebook. I am going to try the Panko on Red Snapper. I think this will give the fish just the right amount of zest! On Chicken Strips = maybe for a salad? One of my favorite dishes is Chicken Francese. I think the Lemon Panko would be wonderful to use since Chicken Francese has lemon in the sauce. I can't wait until I can buy it at my grocery. Thank you! I would love to try these on my home made Mac and Cheese. What a great crunchy topping they would make. I would try it in my eggplant parm. I think it would give a unique flavor!! I think it Lemon Pepper Panko would be a good coating for wings. Chicken would probably be the first thing I'd use it on. I would coat some goat cheese and fry it. I would love to try those breadcrumbs in some stuffed artichokes ... and perhaps at the same time on some chicken cutlets as well. Thanks for the opportunity to win a wonderful prize. I liked "Mommy's Kitchen" on facebook ... thanks again. I'd probably start by just doing an oven 'fried' chicken dish, I've used the plain panko before too and like the extra crunchiness it gives. I'd love to see Michael's book and try some of his other recipes for it. I think this would be delish as fish sticks....maybe use a mild white fish. I think it would be really good on chicken. Bread it up and pan fry and then make a light lemon butter sauce.Serve with angel hair pasta. Yummy! I Like you a lot on facebook! I would use it on some sort of fish. Perhaps a crab stuffed flounder from Trader Joe's. I follow @mommyskitchen on Twitter and tweet this giveaway. Fried Catfish and Fried Green Tomatoes! salmon fillets with the lemon pepper panko. Yum. I would make some chicken tenders. I'd love to make some sort of fish with it! I left a comment anyway. I would like to try Lemon Pepper Panko on chicken cutlets, or even better Milanesa. Maybe eggplant parm, oh so many dishes to try this with. I'd try it as a topping on a mac and cheese that had shredded chicken in it. i will make my lemon chicken. I love your blog btw!! A lot of great ideas to try using the lemon pepper panko. I really like the eggplant and zucchini ideas. I will be trying it with Tuna to go with my Lemon Pepper Spinach Salad for sure!